Church of the Dormition in Jerusalem, where Mary was assumed into heaven. It’s been quiet here on MargeFenelon.com, but not for lack of enthusiasm on my part, I assure you. From just about the moment I stepped of the plane upon my return from Israel, I’ve been up to my eyeballs in deadlines, new projects, family events and (joyful) obligations for my community. In between all of that, I’ve been (unsuccessfully) trying to catch up on the rest I lost on the trip. I haven’t had a moment to breathe! And there won’t be, either, for quite a while. Tomorrow, I leave for Charlotte, North Carolina to attend the Catholic Media Conference. I’m really excited, because I’ll have the opportunity to meet up with colleagues, editors, and new acquaintances in my field. When you’re a freelancer working from home, that’s vital! I’m also excited because I’ll be checking in with my counterparts in a new venture which I hope to share with you about soon. When I return home, there will be more deadlines and more family events. No worries, I’ll be blogging from the conference and will continue to slowly unpack my trip to the Holy Land, because there are many more wonderful sites and insights to share with you. 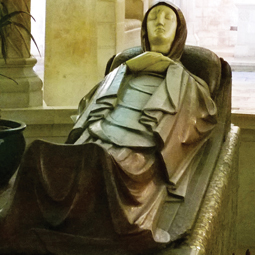 For now, I’ve noticed that National Catholic Register has my article about the Mary places in the Holy Land online right now, and I want to share that with you. I’m sure you’ll enjoy it!